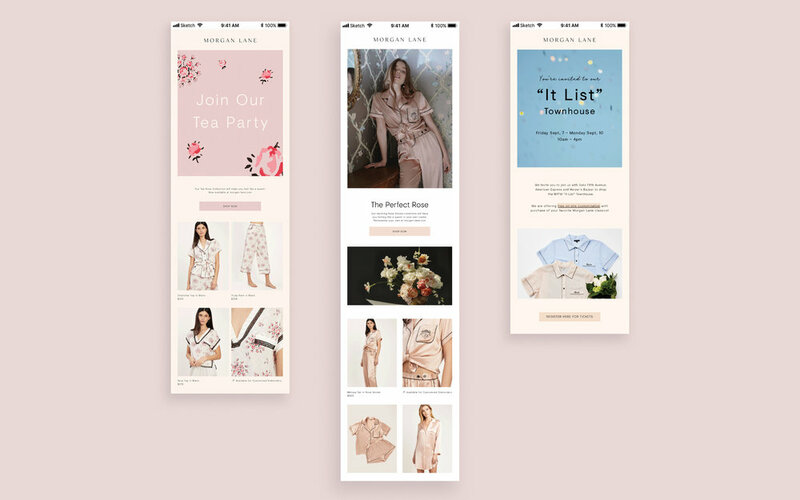 Brief: Create marketing content and digital strategies to elevate the brand of Morgan Lane. Morgan Lane is a New York based lingerie, sleep, and swimwear brand founded in 2015 by Morgan Curtis. Solution: To elevate Morgan Lane, I researched its competitors to understand our brand position, and analyzed our comparative advantage with the client's digital ad team. I interpreted these research and data, and developed three areas of focus that served as guides when redesigning the ads, newsletter, stationary, packaging, lookbook, digital strategy for launching the Resort 2019 Collection, and Morgan Lane's website and app. My focuses were 1) refining graphic elements, 2) establishing consistent use of color, layout, tone of voice, logo, monogram, 3) and increasing customer engagement by incorporating more moving images on all of our marketing platforms.